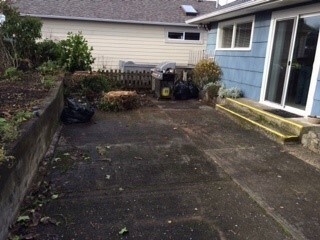 Now that our back yard and house are fully accessible (see below), we are turning our attention toward creating accessibility and quiet spaces in our front yard. 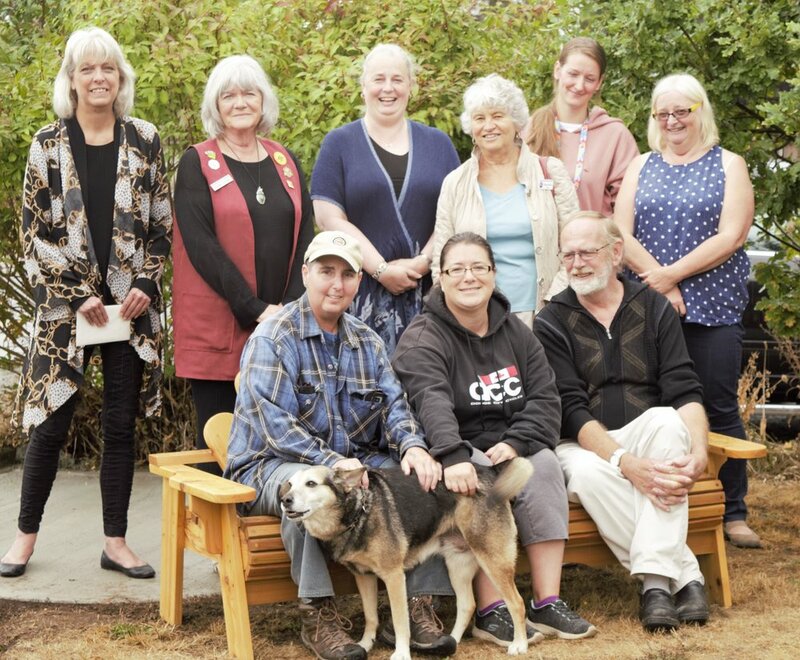 We recently acquired a lovely gazebo through a Parksville-Qualicum Community Foundation/Canada 150 grant, and then added a beautiful handmade bench donated by Sonya Gunderson through the Parksville Lioness Club. The bench sits on a concrete pad donated by Bedrock Redi-Mix Limited. This is the beginning of our front yard upgrade, with landscaping plans designed by Harry Haggard. We have a long way to go and we welcome any contributions from the community. Images: a long view of the yard, the brand new bench, donor Sonya Gunderson sits with Sharon and Board members, and some of our Forward House volunteers, friends, and members. In January of 2014 we moved to our current location, a cozy, well-worn house at 136 East Hirst Avenue in Parksville. Our first major renovation effort was to build an accessible out-building now fondly known as the ‘Dragonfly Den’. We soon realized that the remainder of our property was still inaccessible to anyone with significant mobility issues. The front yard had stairs up to the lawn and more stairs up to the house; the back yard had uneven pavement with a sunken patio which required using stairs to go down and back up again; the house had two small bathrooms, neither of which was accessible. If Forward House was to be truly available to all members of our community, we needed to make some changes. In 2015-16, we embarked upon our ‘Moving Forward with Accessibility’ Project (Phase One). A generous donation from Knox United Church allowed us to leverage the remainder of the funding from BC Rehab, along with discounts from Central Builders and our contractors, The Assemblers. 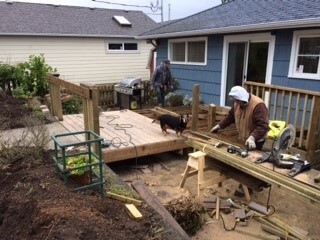 We created a level pathway leading to a wooden ramp-style deck equipped with a scooter parking spot and double French doors leading into our dining room. We added a wooden railing in the main hallway, and a community member donated a folding wheelchair that could travel easily throughout the house. Our back yard is now a warm and welcoming place, with easy access to the house for all. Forward House Executive Director Sharon Welch and MLA Michelle Stilwell cutting the ribbon and celebrate the successful completion of Phase One! With our house now accessible through the back yard, we needed to keep moving forward to make sure community members had full access to our services, including the bathroom! We applied for and received a Grant-in-Aid through the Regional District of Nanaimo as seed funding for Phase Two of the Accessibility Project. Subsequently, we received generous donations from the four local Rotary Clubs: Rotary Club of Qualicum Beach, Rotary Club of Parksville, Parksville a.m. Rotary, and Sunrise Rotary. In addition, we raised almost $1000 from sales of our Client Art Calendars. Phase Two launched in March of 2018. This part of the accessibility project saw our tiny client bathroom transformed into a fully accessible one that will accommodate individuals who have limited mobility and/or use wheelchairs. The renovation involved removing a bathtub/shower; moving a doorway; pushing out a wall; adding tile, cabinets, light fixtures, and mobility aids; moving plumbing; and replacing flooring. We now have a brand new, fully accessible bathroom! Executive Director Sharon Welch and MLA Michelle Stilwell celebrate the completion of Phase Two with a Toilet Paper Cutting Ceremony!